Every summer I escape hockey and the computer by going camping and hiking. The escape from hockey is never far for me. I always carry a few hockey books for evenings of sitting around the camp fire. It is a great way to forget about the daily aches and blisters acquired while chasing waterfalls and mountain tops. On my most recent outing I found myself staying up far later than I should have. I needed the rest for a full next day of outdoor activity, but I was far too immersed in Todd Denault's The Greatest Game. 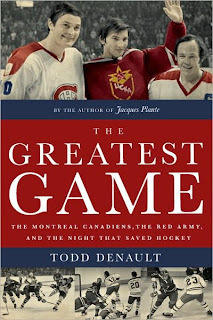 The book is about the famous New Year's Eve clash between the Montreal Canadiens and the Soviet Red Army team back in 1975. My favorite parts of the book are the historical build up to the game. Denault explores the rise of the likes of Anatoli Tarasov, Sam Pollock, Ken Dryden and Vladislav Tretiak. It is a must read text for any fan of the Habs or the Soviets. Denault is as thorough a hockey researcher as you will find, yet he presents his findings with the gift of a storyteller. It is a magnificent book. Here is my original book review. in the fall of 2011. As soon as I found out about additional material I will pass it along.